How Is Rs. 2000/month for a family of six enough? Everyone in the village of Kyalanur in Kolar knows Nagaveni's family. For years their address was a bus stand. The government built their house just a few years ago. Her handicapped elder sister gets Rs. 600 from the Karnataka government's disability pension scheme. 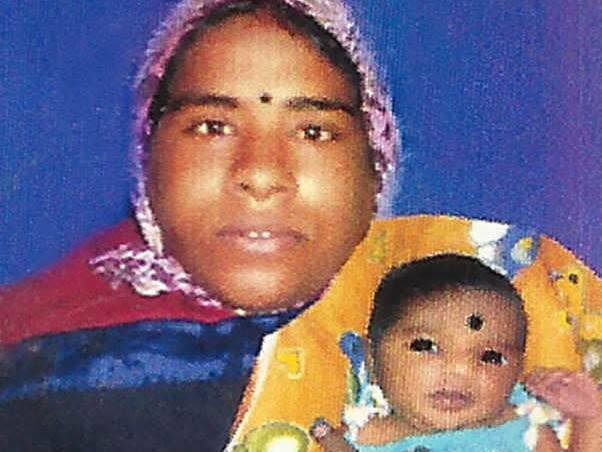 Her widowed mother gets Rs. 1400 as old age pension. 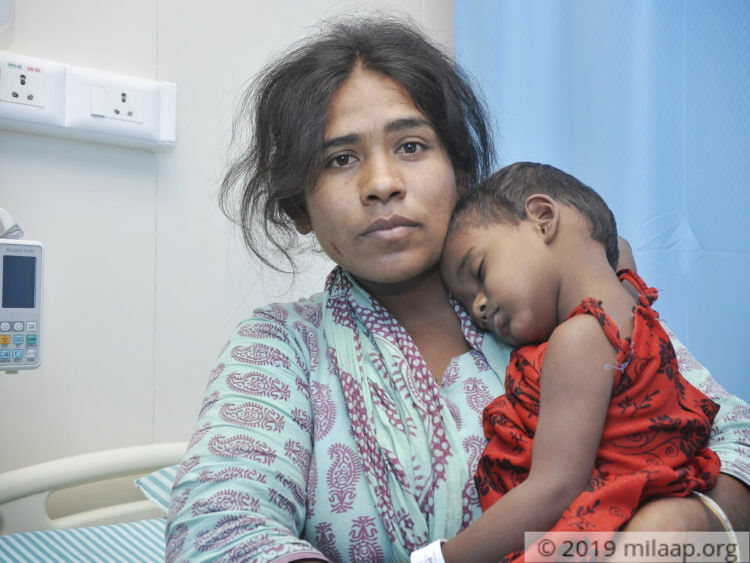 The family lives on this money, and it was not even enough to get a consult when Nagaveni's daughter Sravani's eye began to swell. "We begged so many people to help. For 7 months, I have been running around for money. It is taking time to get Sravani's Aadhar card which we need for getting free treatment at the government hospital. It was a boil. In 7 months, her eye just popped out. Finally, we got a doctor who did tests, helped us find out that Sravani has eye cancer. We were referred to Bangalore and they started with some medicines now." The medicines are slowly helping to reduce the swelling in Sravani's eye. She keeps telling her mother that she is unable to see. She is in pain, scared, and clings to her mother all the time. She asks for her father, but no answer is able to console her. 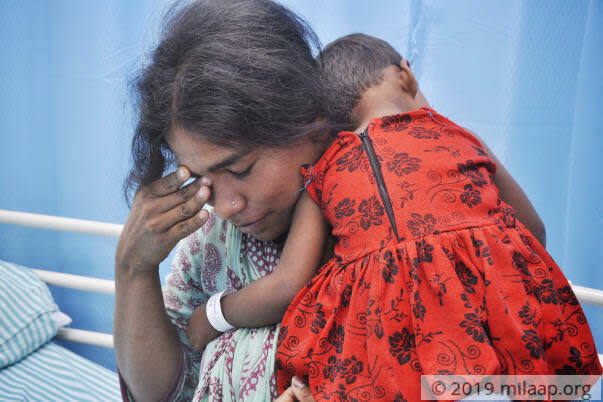 "Sravani keeps crying for her father. That man was not happy to support my family in the first place. When Sravani fell sick, he left us. He said he cannot pay for doctor. She may die, and still he does not care. She is sleeping most of the time now. Sravani does not eat food. She hardly even breastfeeds anymore. 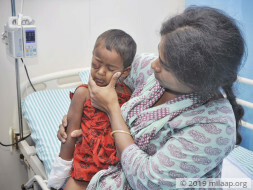 We could not get free treatment anywhere, nor did anyone give us a loan, and because of that Sravani's eye got worse." 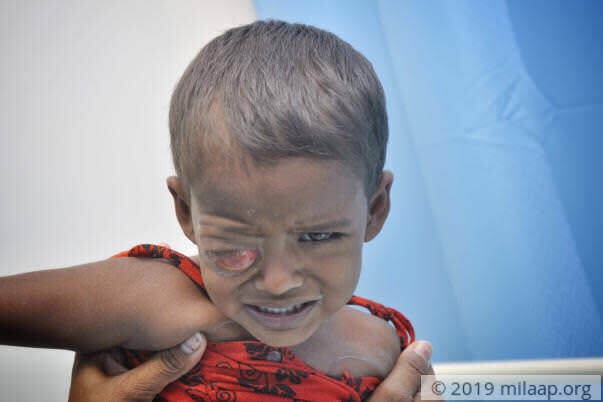 Sravani has retinoblastoma. It is a rare form of cancer in the eye that develops and spreads fast. While Nagaveni knows the name of the disease, she does not understand what cancer really means. She thought drops and treatment can cure her baby's eye, and only recently discovered that this is a disease that could kill the child. "People just said they do not trust that I can repay a loan considering nobody works in our family. Some even told me to abandon hope of saving my child, so she doesn't have to live in a family that cannot support itself. The hospital and doctors, at home and in Bangalore explained everything to me. Even when we could not afford, they helped." Nagaveni pays Rs. 70 every month to a local chit fund. They refused to lend her money against collateral quoting that she would not be able to repay the loan. Her mother and grandmother managed to pawn the only jewellery they had for money. She spent about Rs. 20000 in the village, and Rs. 45000 in Bangalore. Now she has less than Rs. 1000 left. "We have to go to Bangalore on 22nd for treatment. It will cost Rs. 11 lakhs. None of us are employed. Nobody is there to support us. She needs chemotherapy, radiotherapy and medicines to reduce the tumor. If we don't do this in time, I will lose my daughter." Shravani is doing well. Shravani completed three cycles of chemotherapy, she is improving well. We shall keep you posted. I would like to thank you all for your continued support. 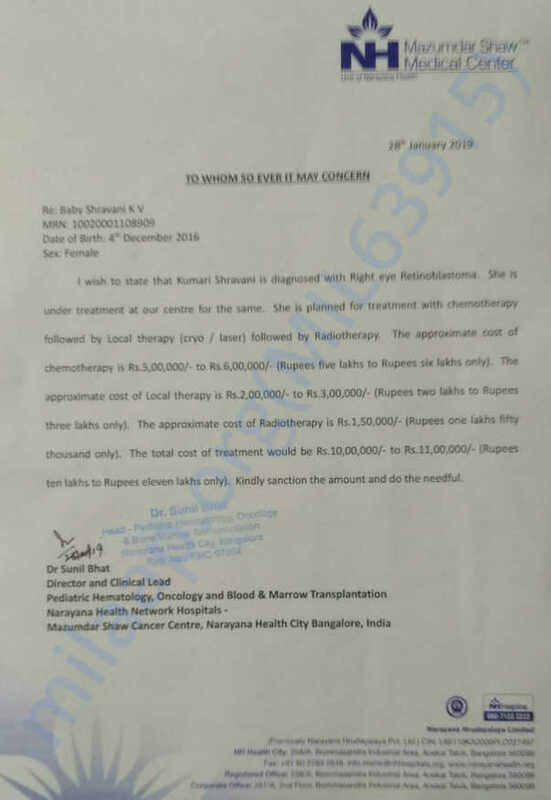 Sravani successfully underwent 2 cycles of chemotherapy and there are 10 cycles left, which will happen in next one year time. The side effects after the chemotherapy are, nauseous and fever. Swelling has been reduced on eye. May God this girl is cured fast! Payment made in memory of my late father, Yousef Sultan AlJaber, who would’ve wanted me to do this. I hope your child has a successful operation and a happy, blessed life. Ameen.